Last weekend I attended Sherlock Holmes Past & Present, two days of academic papers and sandwiches at Senate House. It included some very esoterically titled papers (“Biopolitical Sherlock: Information Technology and Liquid Modernity at Risk”), which inevitably turned out to be more accessible than their banners suggested. I enjoyed actor Richard Burnip on “Holmes and his Contemporaries” – looking at the other detectives who appeared in Strand Magazine -and Nathan Murray on Dorothy L Sayers and her Holmesian scholarship. Thanks to a misbehaving car, I missed Sarah Weaver on “How Smart is Watson?” and Jonathan Cranfield on “Sherlock Holmes, Sport and Masculinity”, but I will catch them in the anthology of papers. For my part I gave, inevitably,a talk on Dead Man’s Land (& Dr Watson), which featured some wonderful slides of nurses and VADs in World War One, loaned by Sue Light (www.scarletfinders.cco.uk), like the one below, which inspired the character of Miss Pippery in the novel. I shared a platform (all right, a room) with writer Jonathan Barnes who creates high-quality audio drama for a company called Big Finish. His take on Holmes is to find the gaps in the chronology, the ‘interstices’ in Conan Doyle’s timeline, and to insert new tales in there. There is, he said, plenty of these gaps to play with. 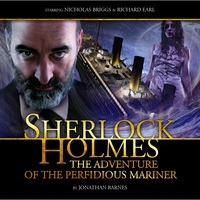 Last year he wrote The Adventure of the Perfidious Mariner for Big Finish, which assumes that Dr Watson’s second wife died on the Titanic (having presumably survived the plane crash I arranged for her). The tale features the haunting of J. Bruce Ismay, the chairman of the White Star Line, owners of the Titanic, by a waterlogged female spectre (Ismay is notorious for having left the sinking ship in a half-empty lifeboat) who is out for revenge. The tale has a genuine Conan Doyle feel, suitably fruity dialogue, familiar and welcome Holmesian tropes, an ingenious method of murder and a cliffhanging ending – what terrible mistake did Holmes make that drove him to retirement and bees on the South Downs? All will be revealed in the four-part The Ordeals of Sherlock Holmes, due out later this year. I’ll be downloading it. See http://www.bigfinish.com. This entry was posted in Books and tagged Dr Watson, Sherlock Holmes on June 26, 2013 by Robert Ryan.